As to what is future, even a bird with a long neck cannot see it, but God only. The Masked Booby, Sula dactylatra, is a large seabird of the gannet family, Sulidae. This species breeds on islands in tropical oceans, especially on the Galapagos islands, except in the eastern Atlantic. The very similar adult Nazca Booby has an orange, not yellow, bill. 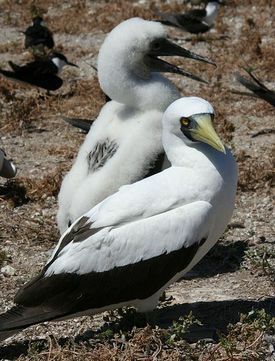 Adult Masked Booby can be separated from other black and white boobies by the entirely dark secondaries and dark tail. Immature boobies are very difficult to identify. Brown and Red-footed have darker bellies. Blue-footed has a white rump patch and a more horizontal demarcation between the dark upper breast and the white belly. Northern Gannets tend to lack the white collar but at a distance may be inseparable. Masked Boobies are spectacular divers, plunging diagonally into the ocean at high speed. They mainly eat small fish, including flying fish. This is a fairly sedentary bird, wintering at sea, but rarely seen far away from the breeding colonies. Bird, bird quote, bird quotes, birds, Latin proverb. Bookmark.